Like I told you before, I as a kid one of my favorite things about Christmas was my Grandma Cope’s homemade candy! On Christmas Eve night, my grandma and grandpa would stop by for a visit and they would always bring a plate of homemade candy. As soon as I saw the plate of candy, that is all I could think about. The only problem was that we had to divide the candy between my 7 siblings, my parents and I. It didn’t last long at our house as you can imagine. 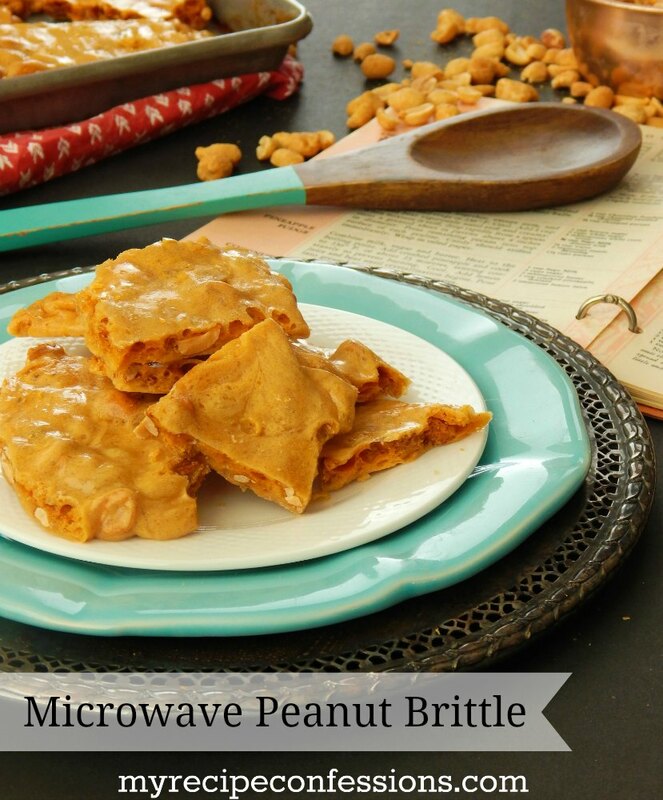 One of the candies that she made was peanut brittle. For years she made it on the stove top. Toward the end of her candy making years, she started making it in the microwave. I make both versions. The microwave version isn’t any faster, but it is easier. However, it does only make about half as much as the stove top version. Another thing to remember is that the heat that microwaves put out varies from one to the next, so you might need to adjust the cooking time of this recipe to better fit your microwave. This recipe is perfect for those times when you need a quick treat or neighbor gift for the holidays. 1. Spray a baking sheet with baking spray and place it on a hot pad. Measure all of the ingredients and have them ready to go. In a medium-sized glass bowl, mix the sugar and corn syrup together. 2. Add the peanuts to the glass bowl (the brittle will melt a plastic bowl) and place in the microwave for 4 minutes. Remove the bowl for the microwave and stir. Place the bowl back in the microwave for two more minutes and then stir. Place the bowl in the microwave again for another 2 minutes. 3. Remove the bowl from the microwave and quickly stir. Then add the butter to the hot mixture and stir again. Place the bowl back in the microwave for an additional 1 minute and 30 seconds. 4. Remove the bowl from the microwave and quickly add the baking soda and gently stir until mixed well. 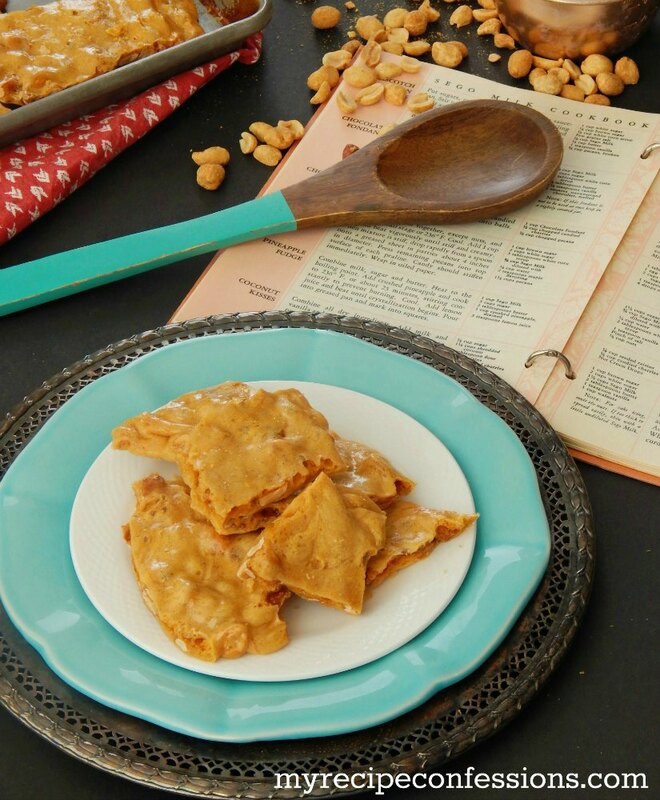 Pour the peanut brittle onto the greased baking sheet. With a greased rubber scraper, spread the peanut brittle out. Let it cool completely before breaking it up. 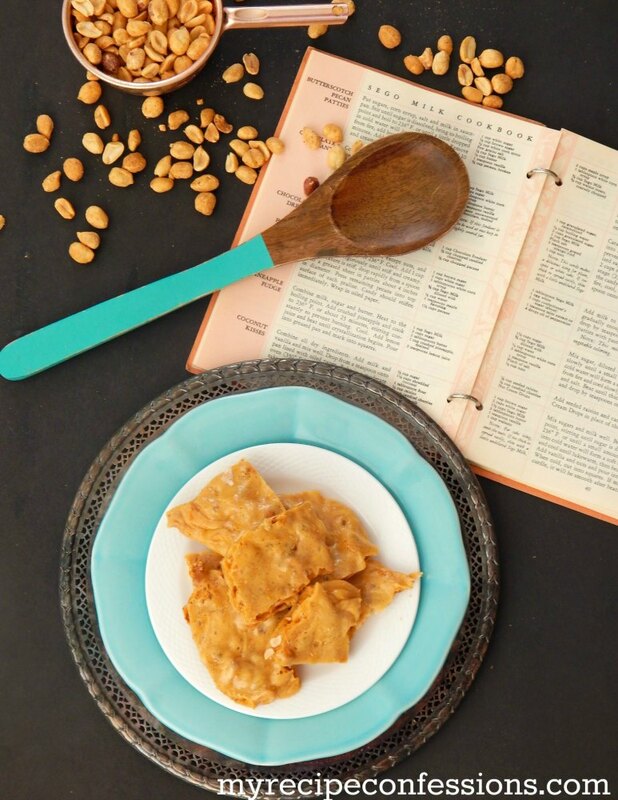 Microwave Peanut Brittle-This is my grandma’s recipe and it is the best peanut brittle ever! It is the easiest homemade candy I have ever made!